Why should YOU have Jim Kleefeld this year? 1. DEPENDABLE - Jim is always on time and never misses or cancels a show. 2. REASONABLE - Jim charges a single flat fee - never added mileage or extra fees. 3. PROFESSIONAL - Jim is a veteran kindergarten teacher and child development expert. 4. EDUCATIONAL - Jim is a true bibliophile. He loves books and always promotes reading. 5. EASY FOR YOU - Jim brings everything he needs. Just get a room and bring the audience! 6. ENTERTAINING - Jim writes each show with material to entertain both children and parents. 7. EXPERIENCED - Jim has presented thousands of library shows all over Ohio for over 35 years. Heroes All Around Us! Heroes in Books! Heroes in Comics! Heroes in the Movies! Jim's new show Hero Magic is all about real and fictional Heroes and Superheroes from fact, fiction and all walks of life. Fun for children and parents alike, this exciting show features stories and tales mixed with magic, all about heroes like Thomas Edison, Superman and Batman, Doctors, Teachers and Librarians - and even Mom and Dad! As always, Jim's shows are interactive, so children get to help create the magic all along the way! 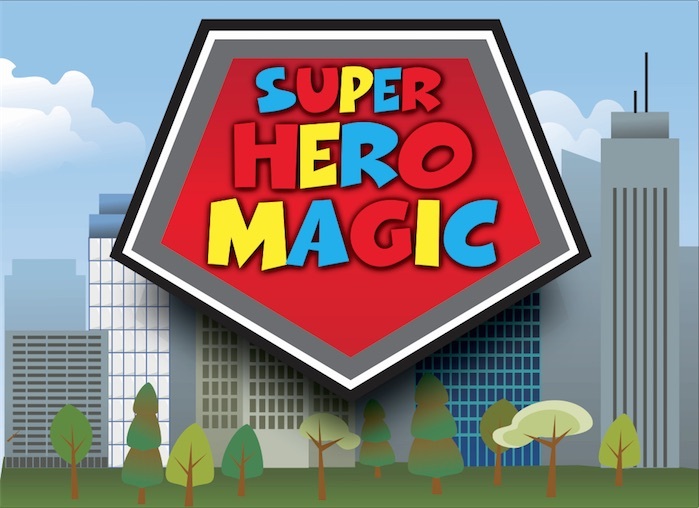 The Hero Magic Show is 45 minutes long, highlights books and reading, is suitable for ages 4-12 and entertaining for parents as well as children. As always, Jim's show is self-contained. He arrives early and he brings everything he needs, including a table, props, equipment, and a professional sound system. Entice your readers into the library for this program. Click either link below, to see a jpeg image of a poster you can use to advertise Jim Kleefeld's Hero Magic Show. When on the page, just send the image to your printer. Be sure to check your printer dialogue box before you push "PRINT." You may need to adjust the SCALE to make sure the image prints at the proper size for your paper output. Print a Poster for this Program. Download the pdf file here, write in the date and time and hang them all around the library (and around town) to get more kids involved in library activites. Librarians all over Ohio hire Jim year after year. Why? His show sparkles with laughter, comedy, amazing magic and professionalism. Jim has many years of experience in creating and presenting shows especially for Library Summer Reading Clubs. He is prompt, professional and polished. As a former Kindergarten teacher, Jim really knows young children. He gets them to help, and always treats them kindly and with respect. In addition, Jim's intelligence and wit keep their parents watching and enjoying the show as much as their kids. And, best of all - you won't have to do a thing except invite the audience! Jim's show is 45 minutes and completely self-contained with a professional table, props, equipment, sound system and music. He will arrive early, bring everything he needs, and set up quickly. Jim Kleefeld is polite, friendly, warm, experienced, and dependable. In 35 years of performing, he has never missed a show. As always, there is one single reasonable flat fee - nothing extra, not even a mileage fees.